These Southwest Chipotle Burger Sliders are a perfect combo. A not too spicy, juicy little burger is topped with a creamy chili lime cilantro queso fresco sauce, avocado and tomatoes all on a toasted bun. They’re perfect for the big game! It’s the start of a new year and I’ve joined a fun new group of bloggers to put together a roundup of recipes on the first day of every month! This month we’re doing sliders just in time for the big games. After you’ve checked out this Southwest Chipotle Slider recipe, be sure and scroll to the bottom of the post for links to all 15 slider recipes! 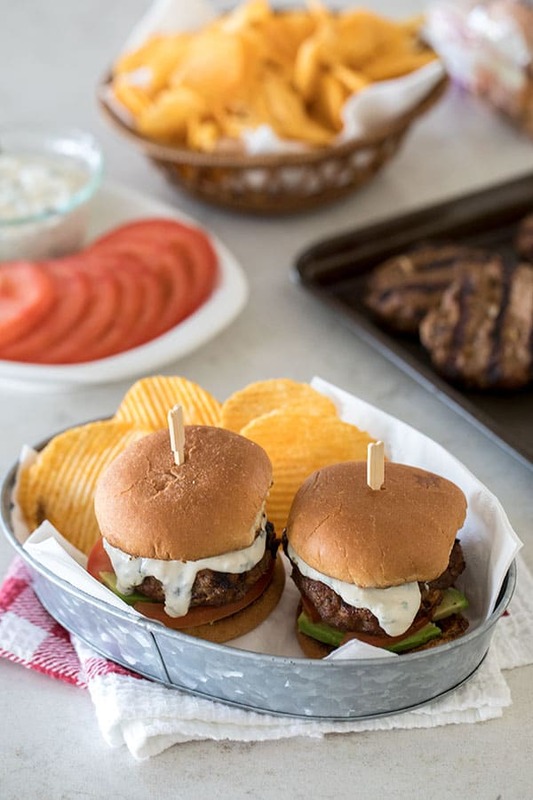 I originally shared this great sliders recipe as part of the Burger Club favorites. The post was in desperate need of some new updated, mouth watering photos. So I was excited when the group voted on sliders for the first month and I could feature this sliders recipe again. This slider is definitely one that everyone who likes a little bit of heat needs to try. I love the combination of cool and creamy and hot and spicy in these sliders. This time around I changed it up and used little sourdough rolls from Winco and made a mile high sliders recipe. Be sure and have lots of napkins handy for this sliders recipe. They are juicy, delicious, messy burgers. Definitely a four star burger. How do you cook sliders? 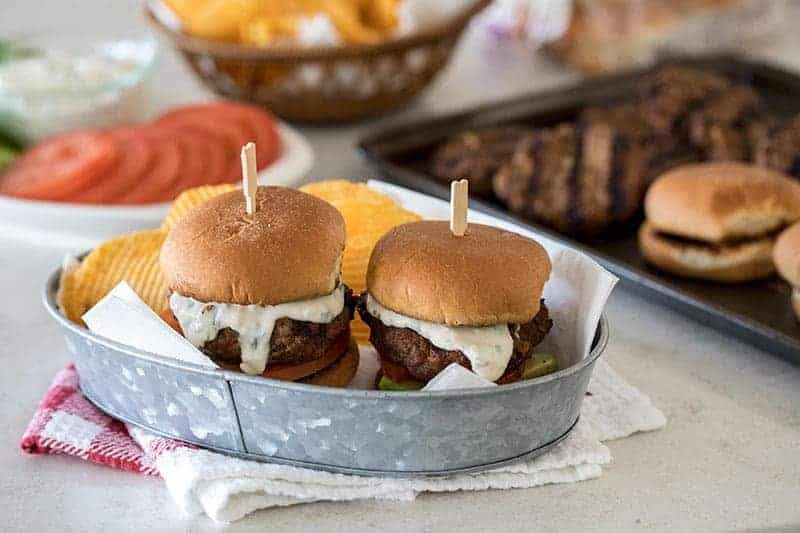 These sliders are essentially just a small version of traditional burgers, so they can be grilled outdoors or indoors on a grill pan or in a skillet. You could even bake them in the oven. These Southwest Chipotle Burger Sliders are a perfect combo. A not too spicy, juicy little burger topped with a creamy chili lime cilantro queso fresco sauce, avocado and tomatoes all on a toasted slider buns. 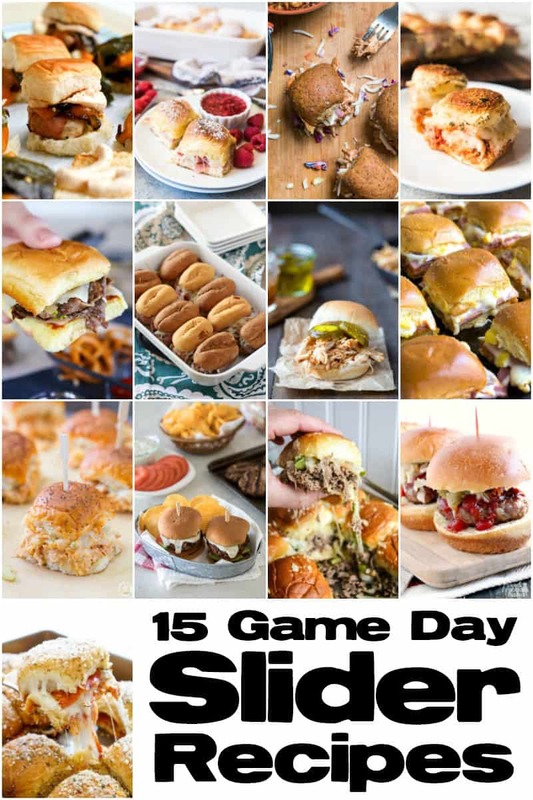 They're a great game day burger! Sauce: Combine mayo, adobo sauce, lime juice and cilantro in a small bowl. Cover and refrigerate. Sauce can be made a day ahead of time. Crumble beef gently with your fingers into a bowl. Add the chipotle peppers, adobo sauce, grated onion, garlic powder, cumin, kosher salt, and pepper. Don't over-work, just mix it enough to distribute the ingredients. Divide into 4 patties (or 6 little ones) and place on a preheated grill, indoor grill pan, or skillet. If desired, top with cheese, during the last few minutes of grilling. When the burgers are done to your liking let them stand for 5 minutes off the grill/pan. Toast buns then spread chipotle-lime sauce generously on each side of each bun. Add burger and top with tomato slices, avocado slices, and a crisp piece of lettuce. OOoh, these sound delicious! They would be perfect for a game day party! I love a kick of spice on my sandwiches and especially smoky Chipotle. These look fantastic! I've never met a chipotle I didn't like, and what American doesn't like burgers? I love everything about this recipe, including the sauce, with its combination of mayonnaise, adobo, and coriander greens. Excellent, and thanks for sharing! This looks so, so good! I'm going to have to try this! As a serious chipotle pepper and burger lover these are making my mouth water like crazy! These will make a wonderful addition to the Burger Free For All! Thanks Barbara! I live in New Mexico so your burger recipe would be a hit with my family. Thanks for posting it! Wow that's some burger! Love the chipotle spice. It looks so pretty!